The report quickly attracted attention from the prominent scientific journal Nature. After interviews with Fan Xiao and other leading Chinese seismologists, who either support or reject his conclusions, the magazine published an article on Fan’s findings on September 10, which created quite a stir back in China. The Nature article cited Fan’s seismic readings from January 2010 to July of this year and his discovery that earthquakes of ≥2M became more frequent in late 2012 through to July 2014, when the 6.5-magnitude Ludian earthquake occurred. 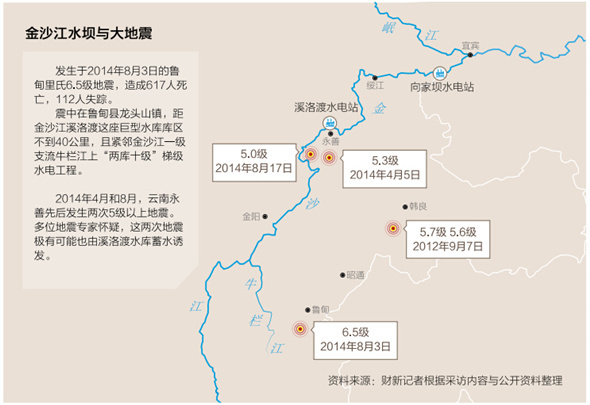 The heightened activity strongly correlates with the filling of reservoirs in the Jinsha River area. Figure 1: Earthquakes of ≥2M recorded in the Xiluodu reservoir and surrounding area. The abscissa shows the period from January 2010 to July 2014, and the vertical axis shows the number of ≥2M earthquakes in this period of time. Source: produced by the author based on officially published data. According to Fan Xiao, there were three seismic clusters, in which earthquakes of ≥ 2M were highly concentrated, one near a dam site at Xiluodu, another at the tail of the Xiangjiaba reservoir, and a third near the tail of the Xiluodu reservoir, which is close to the fault whose rupture led to the Ludian earthquake. This past July, water levels in the Xiangjiaba reservoir had risen a total of 100 meters, increasing its total storage capacity by 4.9 billion cubic meters in just 11 months. Similarly, Xiluodu’s levels increased by 132 meters and its total storage capacity increased by more than 7 billion cubic meters in 15 months. Fan believes that with the rapid and sharp increase of the water levels in the Xiangjiaba and Xiluodu reservoirs, seismic activity on both sides of the two reservoirs was activated. It was on August 1, 2014, two days before the Ludian earthquake, when the Xiluodu reservoir reached 571.7 meters (above sea level), its highest point since impoundment. MAP 1: Hydro dams on the lower Jinsha and powerful earthquakes of ≥5M recorded in the reservoir and surrounding area. Includes the 5.7M and 5.6M earthquakes in Yiliang County on September 7, 2012; the 6.5M Ludian County earthquake on August 3, 2014; and two 5.3M and 5.0M earthquakes in Yongshan County on April 5, 2014 and August 17, 2014 respectively. Source: produced by the author based on officially published data. Fan Xiao believes that the 6.5M Ludian earthquake was “activated” by the impoundment of the Xiluodu reservoir in an already seismically active area. Caixin also interviewed Liu Baojun, a geologist and member of the Chinese Academy of Sciences, who said that reservoirs are indeed likely to trigger earthquakes. The Xinfeng reservoir in Guangdong (Province) induced a 6.1M earthquake in 1962, and the seismic intensity of the epicenter reached 8M. There are also many typical examples of reservoir-induced seismicity (RIS) from abroad. “But whether a specific earthquake was induced by a reservoir needs adequate evidence and careful research,” Liu said. But another view was expressed by Xu Xiwei, deputy director of the China Earthquake Administration at the Institute of Geology in Beijing. In an interview with Nature, Xu disagreed with Fan’s findings. Xu believes that the link between the Ludian quake and the reservoirs is less convincing because the epicenter was 40 km away from the reservoirs and the initial rupture happened at a depth of about 12 km, too deep for the reservoir water to reach. When a reporter from Caixin reached Xu for further comment, he said that he was unwilling to talk more about the matter. Dr. Ma believes that the key to determining if an earthquake is a case of reservoir-induced seismicity lies in whether a number of small earthquakes frequently occur in the reservoir and surrounding area after impoundment. After the earthquake in April, Dr. Ma Wentao travelled to Yongshan County to investigate. Dr. Ma confirmed that this earthquake was induced by the reservoir. Following his trip, Dr. Ma predicted that stronger earthquakes were likely to occur in the region, probably greater than 6M magnitude, and submitted ​​a report on the issue to higher authorities. “Through my field work, I found that stress had reached a critical state in Yongshan region, and this circumstance is like ‘the rice straw that can kill a camel’,” Dr. Ma said. “For this reason, several new reservoirs on the Niulan River [a Jinsha tributary], each of which has a storage capacity of only less than 100,000,000 cubic meters, are also likely to trigger earthquakes. This conclusion [about whether the Ludian quake was induced by Xiluodu and Xiangjiaba reservoirs] could be drawn only after my on-site investigation,” Dr. Ma said in the interview. According to the China Earthquake Networks Centre (CENC), the epicenter of the 6.5M magnitude earthquake that occurred near Longtoushan Town in Ludian County, was located at 27.1N, 103.3E with a focal depth of 12km. Geologist Yang Yong, who visited the quake zone soon after, told Caixin that the epicenter was located precisely in Hangudi Village in Longtoushan Town, less than 7km from the Tianhuaban Dam, the seventh dam in the Niulan cascade, and only about 10km from the backwater area of the Xiluodu reservoir on the Niulan River. In 2012, Toronto-based Probe International published a report “Earthquake Hazards and Large Dams in Western China” by John Jackson. Based on his research on hydro dams in China, the author warned of a potentially deadly domino effect of collapsing dams: in a worst-case scenario, dam collapse could create a tsunami that would wipe out everything in its path, including dams located downstream, causing untold loss of life and property. According to the Chinese government’s current plan, a total of 25 reservoirs (or 27 by some estimates) are being proposed for the Jinsha alone — the equivalent of four Three Gorges projects in terms of capacity and accounting for more than half of the total of all hydro dams which are built or are under construction in the whole of southwest China. On the completion of these dams, the 2,308 km-long Jinsha would be cut into pieces by giant reservoirs, end–to–end, along its main channel. Several geologists interviewed by Caixin agreed that the Xiangjiaba and Xiluodu dams were likely to have increased seismic activity, given that the two reservoirs are connected end–to–end and impounding activities at both reservoirs were carried out almost simultaneously. “To some extent, they can be seen as a single reservoir, so the area under stress is much larger than with a single reservoir,” Fan Xiao said. “Moreover, this region is not only seismically prone but the fault belts crisscross the area resulting in a chain reaction of seismic events. In southwest China, the construction of cascades of hydro dams is everywhere. In the case of the Jinsha, two more giant end–to–end dams, Wudongde and Baihetan, upstream of the Xiangjiaba and Xiluodu dams, are being planned. With a dam height of 289 meters, a storage capacity of 20.6 billion cubic meters and an installed capacity of 14,000 MW (million kilowatts), the Baihetan Dam is larger than the Xiluodu Dam downstream. If completed as planned, the Baihetan Dam will replace the Xiluodu as China’s second largest after the Three Gorges Dam. With a combined total installed capacity of up to 42,100 MW (million kilowatts), the “Big Four” [upstream to downstream Wudongde–Baihetan–Xiluodu–Xiangjiaba] are expected to generate 184.3 billion kilowatt hours of electricity annually, the equivalent of two Three Gorges projects. Many Chinese scientists face difficulty obtaining timely and comprehensive seismic data. This has not only seriously compromised their work, but hindered government departments concerned with the preparation of emergency plans and rescue measures in response to seismic disasters. 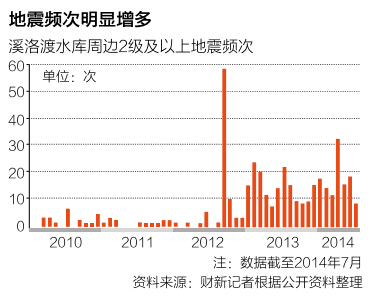 Usually, seismic data in China is made available one or even two years after the occurrence of an earthquake. “I am unable to get seismic data on a timely basis even though I’m working at the Institute of Geology’s China Earthquake Administration, especially seismic data about small earthquakes <2.5M, which is crucial for the study of RIS,” Dr. Ma Wentao said, during his phone interview with Caixin. Dr. Ma also said he had heard that local water resources departments, which hold the data, have signed confidentiality agreements with the Changjiang Water Resources Commission (CWRC ). Furthermore, the seismic data that is officially disclosed is inaccurate, which has also hindered these studies, Dr. Ma added. For example, following 2008’s Wenchuan earthquake, which claimed more than 70,000 lives, the China Earthquake Administration concluded that the initial rupture at its epicenter was located 13km underground. “But this number was measured based on the seismic monitoring network in peripheral areas,” Dr. Ma said. “We [later] discovered that the initial rupture was instead located 5km underground by using the seismic data from the monitoring stations and networks close to the epicenter.” He also told Caixin that the focal depth of earthquakes is another crucial piece of evidence that allows geologists to ascertain whether an earthquake is induced by reservoirs. 1 The author likely means that the Jinsha hangs over the mountains in the Sichuan-Yunnan region and that it hangs over the crisscrossing fault lines of the region.